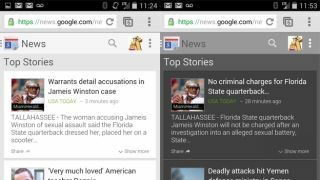 Google has launched a new look Google News mobile web app for iOS and Android devices, giving the site a new, easier to read, look and feel. The revamped service, which is currently rolling out in the US and coming to international smartphones soon, makes it easier for users to browser the feed at news.google.com as well as keep track of individual stories. Users of Google's 'real time newsdesk' are also able to change the theme to a black background and white text, while an easy share button now appears beneath the top stories. The company is also making it easier to navigate to different sections, while the popular weather widget from the desktop version has also been integrated into to the local news section. Meanwhile, Google has also expanded its in-depth article search tool, making it easier for users to immerse themselves in extensive coverage of a subject or event, Engadget reports. Now the 'in-depth articles' Knowledge Graph box, which appears to the right of search results now offers a link at the bottom promising 10 more like minded articles.